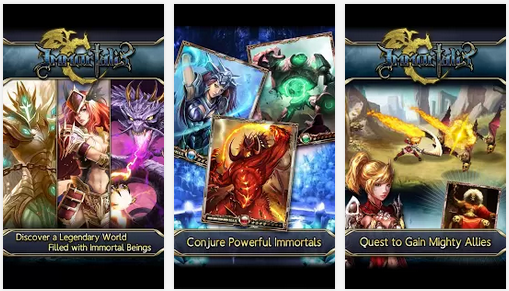 Get immortals through Conjuring and Questing then boost their strength! Assemble a powerful party! Make the most of sacrifice and evolution. Attack enemies to earn GP. The guild with the most GP wins. Use combos and assists to boost friends attack power. If you evolve two of the same Immortal, it's appearance will change, and its stats will increase. It'll be really strong once it's been evolved to it's final stage. Leveling up earns you stat points you can use to boost your stats. If you want to journey to the next area, you'll have to beat the boss at the end of the stage! Every level up, you will received stat points. Stat Points can be used to increase your stamina for questing or to increase the party cost limit for your Immortal battle party. You can restore your MP by Questing, Hailing other players, hatching lucky Eggs, and posting about the game on facebook and twitter. The number of immortals that can be incorporated into your party is determined by Party Cost. The total cost of the immortals with high stats or skills cost more than those with lower stats and skills. You can Increase your max cost by allocating stat point to Party Cost when you level up. Stamina is used to advance through quest. It is consumed while questing and restored at a rate of 1 point per minute. When you level up, you can increase your stamina with Stat Points. Immortals are powerful monsters controlled by players. When you throw an Immortal onto the field, it is summoned to battle. You can collect Immortals through conjuring, questing or by hatching them from lucky eggs. Some Immortals have skills that can be awakened during a battle. Skills have a variety of effects and can be strengthened through Sacrifice. You can strengthen an Immortal by using one or more Immortals asa sacrifice. The Immortals used as the offering will be consumed by the target Immortal, whose strength will increase in proportion to the rarity of the immortals that have been sacrificed. Sacrifices cost Silver Pieces. If you have two of the same immortal, you can evolve your immortal. This special kind of sacrifice will further strengthen your immortal evolves, its level, skill level, and growth rate reset to 0. If you sacrifice an Immortal with skills, the target Immortal's skills will increase. The higher the offering skill level, the higher the rate of skill increase in the target immortal. The battle to find the strongest guide is crystal war. Defeat enemies to progress! On the way, you'll earn Silver Pieces, EXP and more immortals. If you find a lucky Egg, incubate it with your friends to hatch bonus items! Gift of 300 conjure mana and 3000 silver pieces! You can get coins from markets, and wheat from mills. Upgrading either increases their production speed. You can steal coins and wheat by raiding other kingdoms. you'll gain resources even if you are defeated. Markets & Mills don't produce resources. 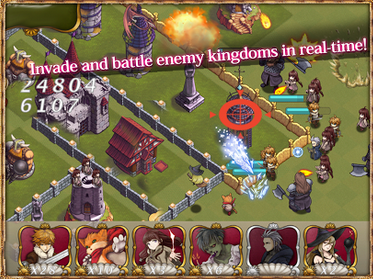 Defensive structures (Earth dragon, Wizard's Tower etc) cannot attack. Upgrading increases a building's maximum HP. 2. Increases the number of each building you can own. 3. Increases buildings maximum levels. Units in your camp participate in raids, but not defense. Earth Dragon can only attack ground units. Wizard's tower can attack both land and air units. Traps are triggered by nearby units. Knight always attack the nearest building. Sorceresses and Mages can attack over walls. Thieves prioritize Coin/Wheat related buildings and deal double damage to those targets! Dwarves prioritize defensive structures (Earth Dragons etc) Take advantage of their high HP and use them as a shield to protect your other units from barrage by defensive structures. Even if you lose a defensive battle, you will never lose all of your coins/wheat. Defense failed? Take revenge using the revenge button. Only the defending player may use the revenge button. You cannot be attacked while your shield is active. Your shield is activated after failing in defense. Your shield will be deactivated if you attack another player. Guilds enable diplomatic relations between kingdoms. Form alliances and offer and receive backup in times of need. Guild reinforcements are also deployed in defensive battles. The core gameplay of Tales of Erin is character cultivation. Adventurers need to gather more characters via summoning and join different battles and trials to earn materials and costumes. In the process of upgrading, more systems will be unlocked and the methods of getting materials will be more diverse. This novice guide will mainly focus on the kind advices, basic operation & main system entrance, method of upgrading and method of collecting resources. If you feel difficult to pass the stages in Main Story, Trial and Massive battle, go enhance your character and costume and then try Main Story first. You can get a large number of Stargems by completing main stages and events. Remember to summon characters with them. Characters will higher star level are, normally speaking, stronger than the ones with lower stars. By clicking Summon button, adventurers will enter the summon page and can get characters by using stargems to summon. By clicking Party button on the bottom left corner, adventurers could edit your group, view the detailed information of the character and enhance your characters. By clicking characters in the Character list, adventurers could view the detailed info of the character and his/her own background story. You can also equip your character in this page. By clicking the image of the Dinivity, adventurers can change the divinity of the party. By clicking the Costume button, adventurers can view the costumes you have, enhance and evolve the costume. Main story. Click the "Battle" button on the main page to enter the main storyline. By passing the stages in main storyline, adventurers can collect Stargems for summoning. Trial. The Place to get materials for character enhancement and character breakthrough. Sequels and side stories. Completing sequels, you would have the chance to win exclusive characters. By clicking Guild button, you can choose to create a Guild or join a Guild. After entering Guild, you can enjoy the bonus brought by Guild Tech, and the rewards of Guild Tower. Also, adventurers can craft costumes here. By clicking Shop button, adventurers can purchase packs and other materials based on the needs. Both paid stargems and free stargems are needed here. For more intro about paid stargems and free stargem, click here or check in game. Darktide Ruins: Darktide Ruins is another place to collect materials and gold needed to enhance characters and costumes. Remember to select your most powerful characters in this battle. Star World Exploration: Another method to collect materials.